A blessing for your hair and skin, jojoba oil has a solution for every problem indeed. Being rich in Vitamins and minerals, this odorless golden liquid is widely used in the beauty products of many popular cosmetic industries. Jojoba oil is really an astonishing wonder. It’s similar to the natural sebum that is produced by your skin and hair, therefore it is used in balancing the oil production of your skin and hair. Just wash your face, pat dry and rub a few drops of jojoba oil on your face and you will wake up to find you have glowing, healthy skin. It has anti-inflammatory properties so it can help with many skin disorders such as eczema and rosacea. Apply directly to the affected area twice a day and you will be amazed to see the improvement in your skin in such a short time. Jojoba oil doesn’t clog your pores therefore it helps in treating something as dreadful as acne. It works as an antiseptic, clears the skin and reduces scars or marks. As it controls the natural sebum production it also helps to reduce the recurrence of acne. Just apply a little amount to the affected area and leave it overnight. Wash it off the next morning. Jojoba oil can be used as a substitute for hair serum. It aids to help lock the natural moisture into the hair shaft and add shine and luster to your hair by protecting it from external damage caused by pollution and chemicals. It’s time to get back to basics. Switching to organic products to take care of your skin and hair is best as organic products improve skin and hair without the chemical side effects. So help the planet, help yourself and opt for more natural and organic products in your life. Lucky for you, we have some amazing Organic Jojoba oil available on our website, purchase here. Rosehip Oil – Why You Should Be Using It! Alright, so you decided to go all organic with your skin and hair care routine, and you are actually looking for a miraculous wonder that helps you reduce your skin and hair problems in minimum time. Well worry not, just add rosehip oil to your list. Rosehip oil has some astounding benefits if used as a regular moisturizer. It has nourishing fatty acids and vitamins that help in treating wrinkles and aids you in maintaining younger looking skin with a dewy, healthy glow. Rosehip oil hydrates your skin and the rich levels of vitamin A and C help you get rid of pigmentation without making your skin appear greasy and unctuous. Open pores is a frustrating problem as it can cause serious damage to your skin. Rosehip oil is rich with astringent characteristics, so applying a little amount in a diluted form may help you tighten those deep pores and get you the bright glowing skin you are after. If you have sensitive skin then uneven skin tone could be a common issue for you. No need to lose your mind, just apply a little of this wonder oil to your face two times a day, this miraculous little thing is gentle on your skin, it helps you minimize those uneven skin patches and gets you a settled and even complexion. You don’t have to spend big bucks to get the glowing healthy skin you always wanted, all you need is a little change in your skin care products. Organic products such as this have proved to be safer and more effective in improving skin conditions. Even big celebrities like Kate Middleton and Miranda Kerr swear by it so what is holding you back? Give it a try! 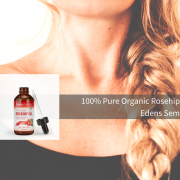 Get your hands on our amazing Organic Rosehip Oil for yourself here! 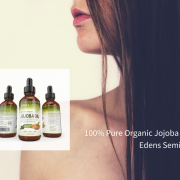 https://edenssemilla.com/wp-content/uploads/2018/10/100-Pure-Organic-Jojoba-oil-1.png 788 940 Sharni https://edenssemilla.com/wp-content/uploads/2016/10/edens-logo.png Sharni2018-10-15 11:13:052018-10-15 11:13:05Rosehip Oil - Why You Should Be Using It! 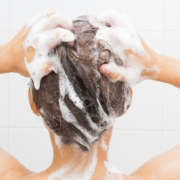 Who wouldn’t have thought you can make shampoo at home? This all-natural shampoo will do wonders for your skin. It features essential oils which are great for nourishing, cleansing and strengthening your hair follicles. Disclaimer: If you have high blood pressure or you’re pregnant, avoid using rosemary essential oil and go for lemon or lavender one instead. Make the homemade shampoo by combing the castile soap in a container (preferably something with a flip top for easy use) and add both the essential oils in it. Mix and then add the water. Combine and it’s ready! To use, squeeze a few squirts onto your hair and shampoo + rinse as usual. You need to try out this amazing recipe right now, it’ll leave your hair smelling extra good. Age gracefully. In the natural skin-care industry, many theories arise behind what methods decrease the aging process. Non-traditional methods have increased their presence in mainstream methods. Many require trying, altering and experimentation to find the right combination. According to Ayurveda practices, Vayasthapana is an anti-aging theory and herbal formula. There are many non-traditional approaches to anti-aging. Vayasthapana translates to “maintaining youthfulness”. It’s a combination of several herbs. One in particular, Gotu Kola, is said to have a long-term effect on the aging process. It’s said to enhance collagen synthesis. More collagen means the lesser appearance of wrinkles. This herb can be taken in a supplement form or steeped in warm water. Twachya herbs Support skin moisture. Gotu Kola, Silk Cotton Tree, Costus, and Rose comprise this herbal combination. As a whole, these herbs can be found as a supplement or specialty made by an acupuncturist or herbalist. Grapefruit is a natural fruit packed with Vitamin A, C and E. Consider taking these supplements with a glass of grapefruit (unsweetened). Ginger is potent but holds very powerful anti-aging remedies. The herbs of the ginger family are rich in anti-oxidative ingredients. Ginger helps increase blood flow, which can naturally reduce the signs of aging. On a cellular level, ginger is said to reduce inflammation. On a topical level, ginger can increase mood and stabilize energy when taken on a regular basis. Ginger comes in many forms. Try as an herbal tea or supplement. Follow the instructions as provided for any herbal supplement. Turmeric. Turmeric is the magic word these days. It’s mustard color is vibrant and standards out among traditional Indian spices. Turmeric rhizomes come in the form of curcumin, curcuminoids and tetrahydrocurcuminoids possess. 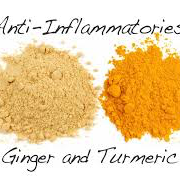 Each hold anti-inflammatory properties. The taste is bitter and potent. Oxidative damage is said to be a prime component in the aging process. Increasing turmeric intake reacts with what are known as ‘free radical’ compounds. Ashwaganda has its roots in non-traditional Indian medicine. It’s in the same family as the tomato, although it tastes vastly different. It comes in many forms. It’s most commonly taken in a capsule. Ashwaganda can be found in a sticky paste and added to teas and other warm drinks. It’s known to increase thyroid levels and serve as a restorative herb to slow the aging process. Increasing thyroid levels can decrease the aging process. It provides the added benefit of preventing sluggishness, which can lead to increased moods and energy. As a routine, it can be ingested in powder form in a glass of warm milk before bed.